Meathead Movers is here to take care of the heavy lifting for you on your move to Bloomington. Our clean-cut student athlete movers are ready to get you safely settled into your new Bloomington home. The six square miles that comprise Bloomington, California have yet to have been incorporated. However, the little town that sprang up around the Riverside Portland Cement Company in the early 1900s has certainly grown up over the years. Today nearly 30,000 residents call this part of San Bernardino County home and more people are moving to Bloomington every year. If your future includes a move to the area, you are going to want to choose Meathead movers, the best team of Bloomington movers. At Meathead, we can make your move as easy as possible by managing every aspect of your local, long-distance, or commercial move to Southern California. Meathead Movers was founded in 1997 by two teenager brothers named Evan and Aaron Steed when they were still in high school. The Steed brothers were student-athletes, determined to make it through school while earning their own spending money. They started out by moving their family friends. It wasn’t long before the Steed brothers had enough work to hire other student athletes who were clean-cut, hardworking and prepared to hustle. To this day, Meathead Movers continues to hire motivated student athletes who work their way through school. Meathead Movers are dedicated to completing your move as fast as possible. 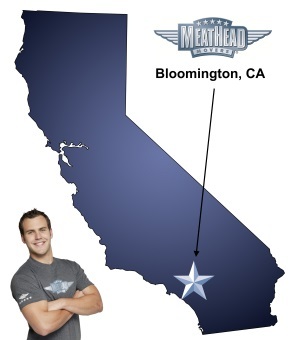 In fact, Meathead Movers are known throughout California as the moving guys who jog back to their truck between loads. Our movers are the most energetic and efficient movers in business today. Meathead Movers is a full-service moving company, able to offer things that other Bloomington movers don’t. For one thing, Meathead offers a 100% satisfaction guarantee with every move we manage. We don’t know of any other Bloomington movers who offer such a solid promise of customer satisfaction. We also provide reliable packing, storage, on-site relocations, and our distinctive moving concierge service, which connects you with local service providers. When you’re ready for free no-obligation moving quote, go ahead and give Meathead Movers a call at (866) 843-6328. The sooner you do, the sooner we can work together to plan and organize your relocation. With Meathead Movers you don’t need to worry, because we do the hard work and heavy lifting for you. Moving to Bloomington? Here are some helpful resources. I loved everything!!!! My movers Jonathan and Samuel were amazing. They were professional, courteous, respectful, proficient in moving large, awkward items, they were the best! I really cannot say enough about them. I have already been telling anyone who will listen. They arrived about 15 minutes early, worked non-stop, moved quickly, and did not damage a thing. Amazing!!!! This was a no stress move for sure. Thank you so much!!!! Brandon, Logan and Jamie were so kind and friendly, so efficient and yet careful. I had been dreading this move and their professionalism and upbeat personalities made it a great experience. Can't say enough about how great the guys were. The staff that assisted me over the phone was extremely helpful and gave me options for my move when the 'typical' move was too expensive. The two movers that showed up, Juan and Jonathan, worked very hard, were friendly, and conscientious of the items/walls/house.